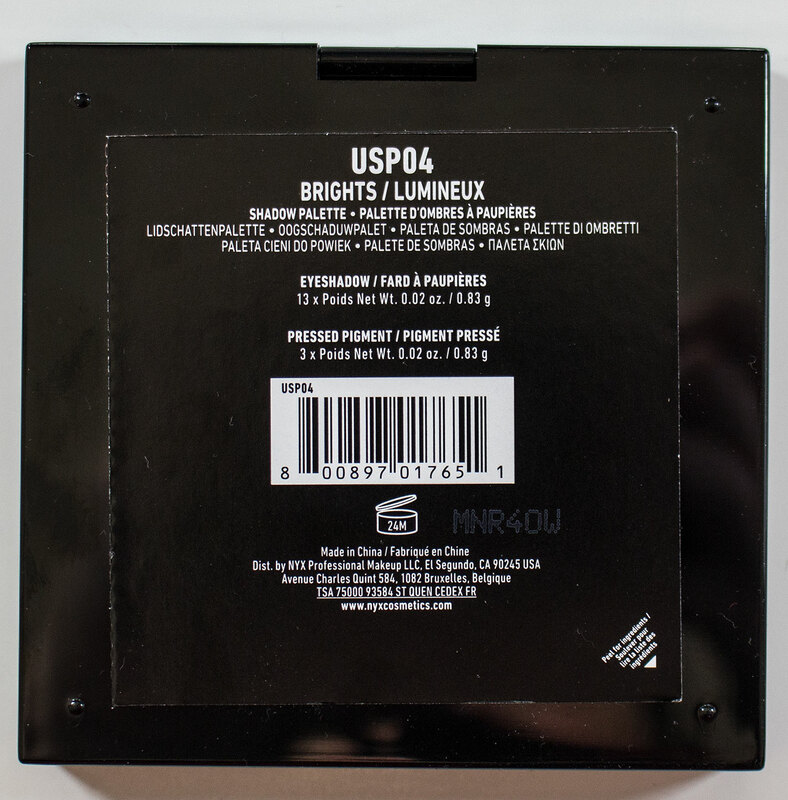 The NYX Ultimate Shadow Palette in Brights retails for $18US and $22CAN for 16 x 0.02 g / 0.83g of eyeshadow product. NYX Ultimate Shadow Palette in Brights back of the palette. 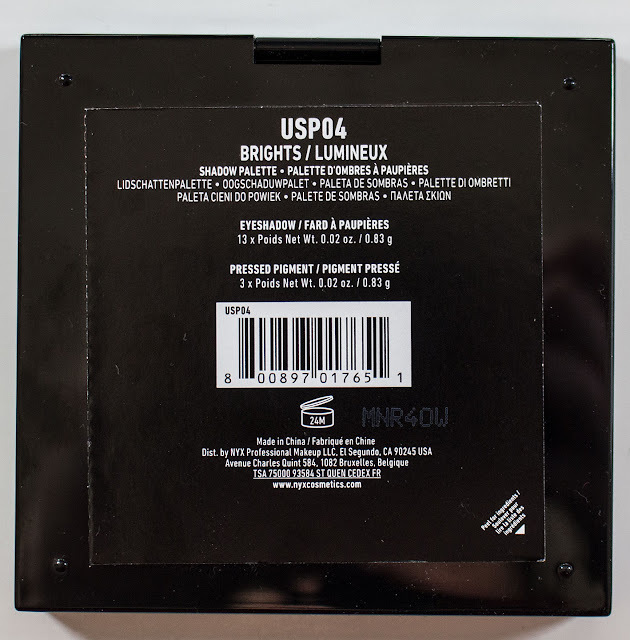 NYX Ultimate Shadow Palette in Brights palette opened. Shades 01, 04, 09, 10, 11, 13, 14 & 15Talc, Magnesium Stearate, Dimethicone, Hydrogenated Polyisobutene, Octyldodecyl Stearoyl Stearate, Bis-Diglyceryl Polyacyladipate-2, Tocopherol, Ethylhexylglycerin, Phenoxyethanol. MAY CONTAIN / PEUT CONTENIR (+/-): Mica, Titanium Dioxide (CI 77891), Iron Oxides (CI 77491, CI 77492, CI 77499), Blue 1 Lake (CI 42090), Carmine (CI 75470), Ultramarines (CI 77007), Yellow 5 Lake (CI 19140). Shades 07, 08 & 12Talc, Magnesium Stearate, Dimethicone, Hydrogenated Polyisobutene, Octyldodecyl Stearoyl Stearate, Bis-Diglyceryl Polyacyladipate-2, Alumina, Triethoxycaprylylsilane, Tocopherol, Ethylhexylglycerin, Phenoxyethanol. MAY CONTAIN / PEUT CONTENIR (+/-): Mica, Titanium Dioxide (CI 77891), Iron Oxides (CI 77491, CI 77492, CI 77499), Blue 1 Lake (CI 42090), Carmine (CI 75470), Manganese Violet (CI 77742), Yellow 5 Lake (CI 19140). Shade 05 & 16Talc, Magnesium Stearate, Dimethicone, Hydrogenated Polyisobutene, Octyldodecyl Stearoyl Stearate, Bis-Diglyceryl Polyacyladipate-2, Tin Oxide, Tocopherol, Ethylhexylglycerin, Phenoxyethanol. MAY CONTAIN / PEUT CONTENIR (+/-): Mica, Titanium Dioxide (CI 77891), Iron Oxides (CI 77491, CI 77492, CI 77499), Carmine (CI 75470), Manganese Violet (CI 77742), Ultramarines (CI 77007), Yellow 5 Lake (CI 19140). Shades 02 & 03 – Pressed Pigments (Not Recommended For Use Around Eyes, pink and coral red)Talc, Magnesium Stearate, Dimethicone, Hydrogenated Polyisobutene, Octyldodecyl Stearoyl Stearate, Bis-Diglyceryl Polyacyladipate-2, Barium Sulfate (CI 77120), Tocopherol, Ethylhexylglycerin, Phenoxyethanol. MAY CONTAIN / PEUT CONTENIR (+/-): Mica, Titanium Dioxide (CI 77891), Red 6 (CI 15850), Red 7 (CI 15850), Red 28 Lake (CI 45410), Ultramarines (CI 77007). Shade 06 – Pressed Pigment (Not Recommended For Use Around Eyes, pinky/purple))Talc, Magnesium Stearate, Dimethicone, Hydrogenated Polyisobutene, Octyldodecyl Stearoyl Stearate, Bis-Diglyceryl Polyacyladipate-2, Tin Oxide, Tocopherol, Ethylhexylglycerin, Phenoxyethanol. MAY CONTAIN / PEUT CONTENIR (+/-): Mica, Titanium Dioxide (CI 77891), Red 6 (CI 15850), Red 7 (CI 15850), Red 28 Lake (CI 45410), Ultramarines (CI 77007). The matte shades in this are all matte and some have a slight satin finish due to soft micro shimmer in the shades. 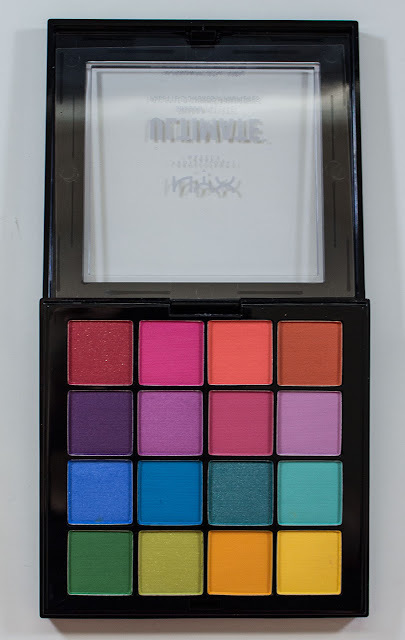 All the shades are pigmented and powdery due to the purer colourant nature. They are smooth to apply but better to pat over a primer because you can blend them away because of the higher pigmentation. They are true to pan shade-wise which make them great for such bright pops of colour. Shade 1 is a true red with a matte finish and subtle white shimmer. Shade 2 is a hot pink with a matte finish. Shade 3 is a coral-orange with a matte finish. Shade 4 is a bright burnt orange with a matte finish. Shade 5 is a deep purple with a matte finish. Shade 6 is a bright lavender fuschia with a matte finish. Shade 7 is a light magenta with a matte finish. Shade 8 is a pale lavender with a matte finish. Shade 9 is a bright denim blue with a matte finish and subtle white shimmer. Shade 10 is a bright true blue with a matte finish. Shade 11 is a bright teal with a matte finish and subtle white shimmer. Shade 12 is a light aqua with a matte finish. Shade 13 is a grass true green with a matte finish. Shade 14 is a chartreuse with a matte finish and subtle white shimmer. Shade 15 is a buttercup yellow with a matte finish. Shade 16 is a bright yellow with a matte finish and subtle white shimmer. Most I get about 7 hours of wear without a base with these eyeshadows. 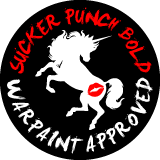 With a primer way longer! 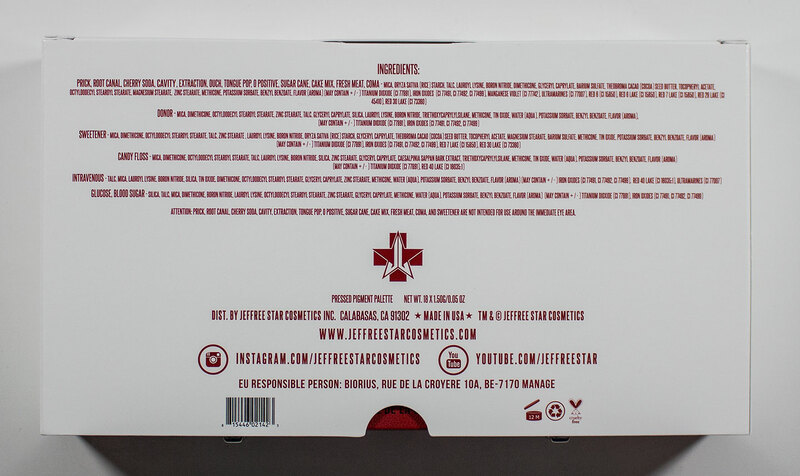 Packaging: The palette is a simple plastic compact with a clear lid to show off the shades. Shade 9, Shade 10, Shade 11, Shade 12, Shade 13, Shade 14, Shade 15, & Shade 16. 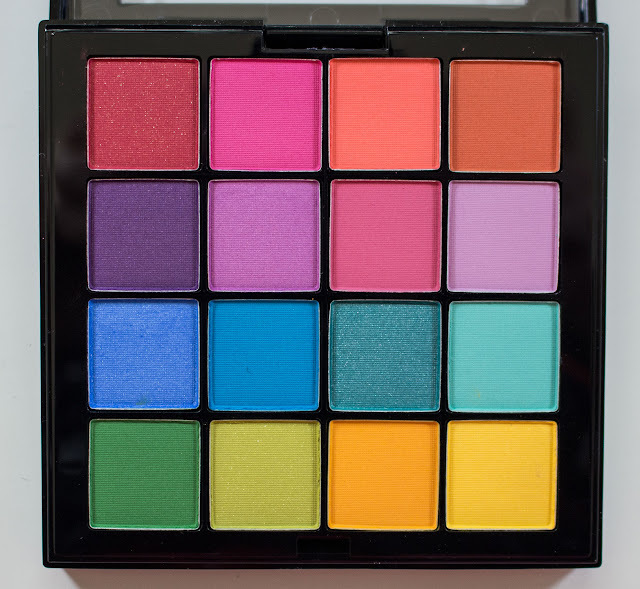 This is a very powdery pigment eyeshadow palette. That not to say that it's bad but rainbow shades are always powdery in a matte formula and these are VERY nice for a cheaper brand. 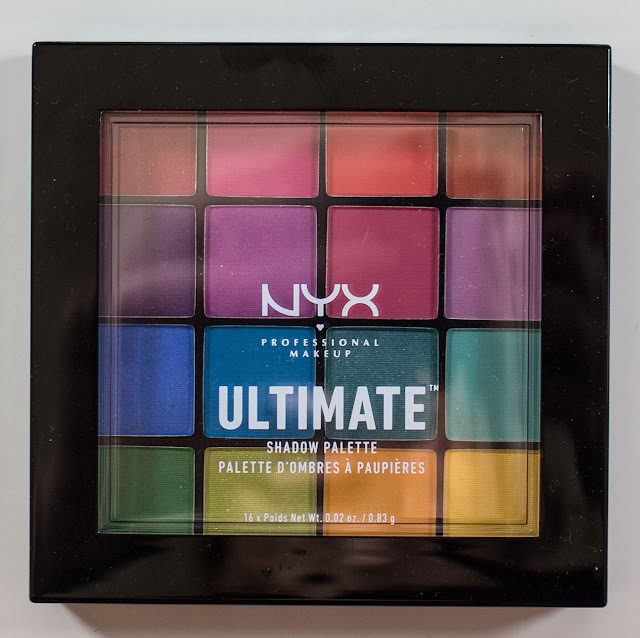 They will need a primer to keep them on all day but the pigmentation is perfect and it's been a hot minute since I've reviewed NYX eyeshadows so Kudos to them on this one.